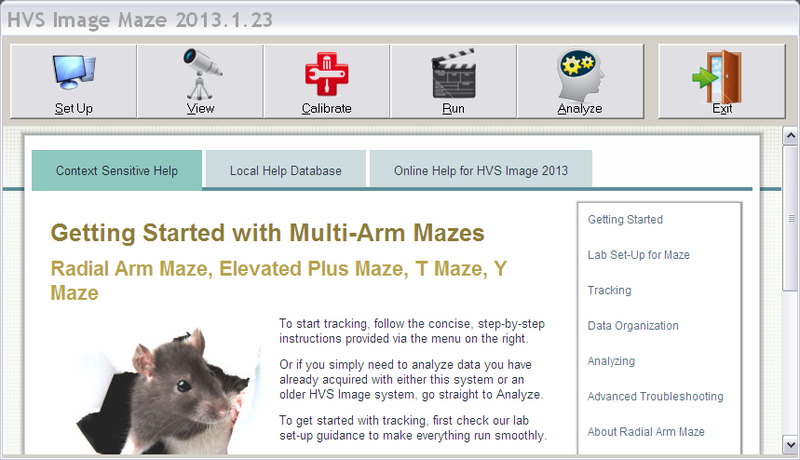 HVS Image have announced a new tracking and analysis module for Elevated Plus Maze as part of the HVS Image 2013. Like the previous HVS Image 2020,2100 and 2012 systems, the 2013 has full backwards compatibility so you will be able to capture and analyze more data yet retain your experiments and user training, but now it's a software package that you can use a generic web cam with on a standard off the shelf laptop. This keeps performance and ease of use high with the costs kept right down, lower in fact than any of the rival systems. The HVS Image Plus Maze Module has powerful context sensitive help that allows inexperienced users to be up and running in minutes rather than days. It shares a simplified UI (user interface) with the other new HVS Image 2013 software which also supports Morris Water Maze, T-Maze, Y-Maze, Radial arm and Open Field. We'll post new pictures of the system here as we get them.